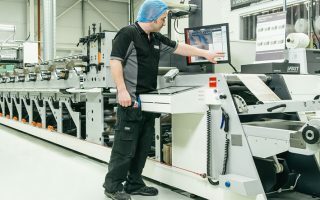 Flexo and HP Indigo digital presses, creating unique labelling for a range of industries. 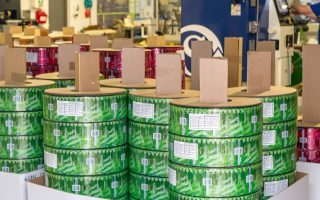 customer to benefit from shrink sleeves, which completely repositioned the company in the marketplace. 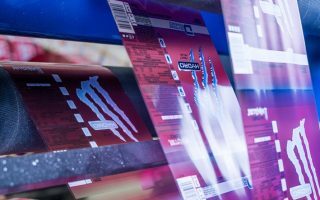 Having invested in a printing press that uses the very highest-spec HD plates, Nuprint can deliver exceptional quality shrink sleeve packaging for clients in just a few days. We’re also quite unique in offering cold foiling for shrink sleeves and can do colour cold foiling at any stage of the process, even overprinting the foil. Expertly designed and printed in HD, our shrink sleeves are available with innovative blackout backgrounds, as well as the standard clear and white options. We can apply any finishes – including metallic – and guarantee superior colour-matching, using our advanced X-Rite eXact colour measuring machinery. Made from recyclable PETg or PVC, our shrink sleeves can be reverse-printed, creating scratch-resistant labels that ensure your products remain in pristine condition. Sleeves can also be printed on the biodegradable PLA material. – Also works as a protective seal for products. – Suitable for even the most complex containers.